On August 4th 2008 my mother Jožica (Josephine) celebrated 83rd birthday. She is is a big fan of nature and especially mountains. She likes to hike despite her age. Last year, after I got my pilot license, I took her on a sightseeing flight to Triglav (2884m), the highest Slovenian mountain. She was so happy that time that I decided to give her a special kind of a birthday gift this year - a flight across the Slovenian and Austrian Alps to Salzkammergut in Austria, Salzburg, with a short stop at Zell Am See (LOWZ). The weather forecast for August 7th was excellent and we departed early in the morning. The route was: Divača - LJAJ - KANIN - ARNOS - LOSM - Gmunden - Mondsee - Hallein - Koenigsee - LOWZ. Over alps there were some clouds between FL90 and FL100 so I decided to climb to FL110 and later descen to FL100. The weather in Salzkammergut was even better - the visibility was more than 100km. Two years ago I visited Salzkammergut with car, however, the view from the airplane was much more fascinating. I was astonished by the color of the lakes which seemed so surrealistic - a color that you usually don't see many times. My mother was silently enjoying this beautiful sight. At Gmunden we turned to the west towards Mondsee lake. The church in Mondsee village was used for the wedding ceremony in the famous movie "The Sound of Music" which won the Academy Award for Best Picture of 1965 and is one of the most popular musicals ever produced. Further on we were flying abeam Salzburg city towards Koenigsee in Germany. We overflew Eagle’s Nest, the famous Adolf Hitler’s residence near Berchtesgaden and continued to Zell am See (LOWZ) airport, which is located near a lake between high mountains. Just few kilometers away is Kaprun, very well know skiing center and also know because of the tragic accident which happened years ago. We took a short walk towards the Zell am See village and had a lunch in the airport's restaurant. In the afternoon some cumulus clouds start to gather over the mountains so I decided to depart as soon as possible. LOWZ has an interesting traffic pattern which avoids populated areas. When departing you must first climb to 4000 feet in traffic pattern and only then you can leave it in the desired direction. On the way back the clouds already obscured the highest mountains so we had to fly more to the east to gather more altitude and also there were less clouds. 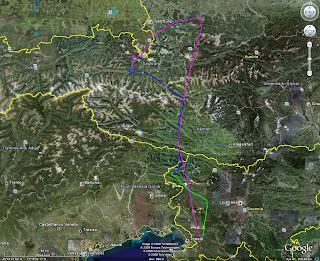 The route back to Slovenia was almost the same as that one in the morning with a small exception - we first landed at Bovec (LJBO) airfield in Slovenia for a short stop. After landing in Divača I called my father, age 86, to notify him, that his beloved wife is still "alive" and in "one piece".